Karen Carpenter – drummer, angelic singer, tiny, anorexic, with a longevity that many celebrities long for. She was born in New Haven Connecticut at 11:45am on Thursday March 2 1950. Uranus on the Ascendent? I think she really wanted to be a girl drummer doing the “exotic beats” that she was known for playing when a very young girl. Mars conjunct South Node in the 5th house brings neediness to romance, falling on partners (Libra) to fulfill oneself. The North Node in Aries insists on standing alone, leading and innovating in a solo way. If she hadn’t passed on at the age of 32, I think she would’ve continued to move away from “partnerships” to solo performances. 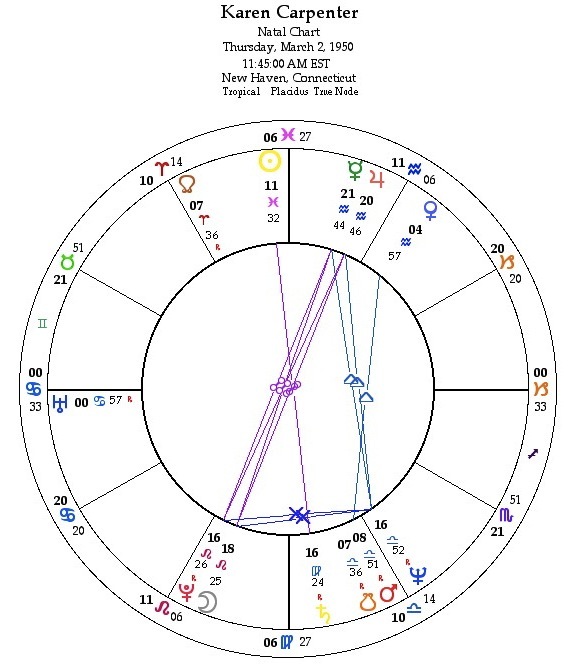 But the need to have a brother, a lover, a partner would always be there – Men are Mars and it’s tough to move away from a Mars/South Node conjunction. Her solo album which her brother and producer didn’t like that much and the recording studio wasn’t happy with was canned and she went back into a partnership with Richard Carpenter. Tough for an Aries North Node that must keep competing to stand alone. The Sun on the Midheaven cannot hide their light under a bushell. Ever. Venus in the 8th house has to express love and emotion at a real level, to crowds (Aquarius). This is not ‘pop’ music but ‘real’ emotion being produced. What interests you in this chart? what aspects have you noticed?